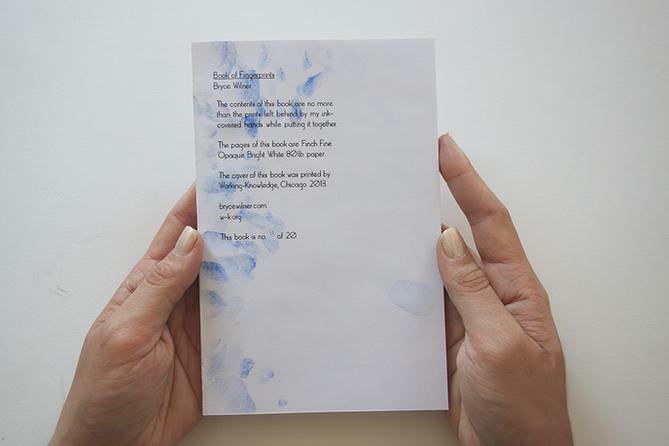 Book of Fingerprints is an artist edition by Bryce Wilner, designer of the Gradient Puzzle for Areaware. The contents of the book are the residue of it's creation. Each page contains a unique accumulation of marks. Each of the 20 hand made editions a unique work of art. Wilner's only description is fitting in it's straight-forward tone, "I pressed my hands into a blue stamp pad and assembled twenty perfect-bound zines." More books and projects on the brycewilner.com, available to purchase at Printed Matter.